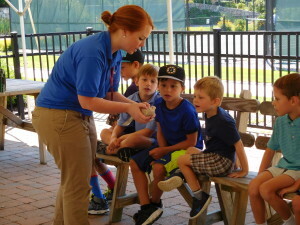 This week, the Roger Williams Zoomobile traveled to the Bay Club to present “Who is Living in Your Backyard?” to the children in the Club Seahorse program. The presentation included information on some of the wildlife that can often be found in the various habitats the Southcoast has to offer, and what attributes the animals have that help them survive in those habitats. 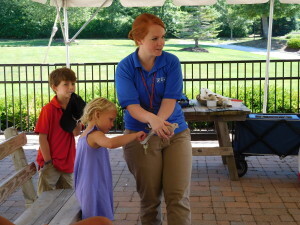 A few animals from the Zoo accompanied Emily, the presenter for all of the children to meet. 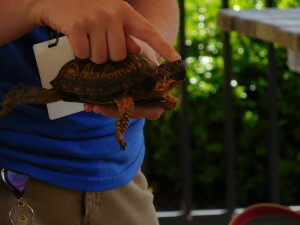 First up was Bitz the Box Turtle. The zoo obtained the turtle from someone who had him as a pet, and decided they couldn’t give him the proper care he needed. Due to insufficient nutrition as a young turtle, he possesses a dented shell that never formed correctly. 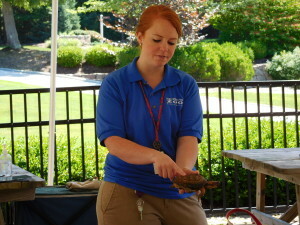 Most of the children enjoyed seeing him up close and having the opportunity to touch his shell. 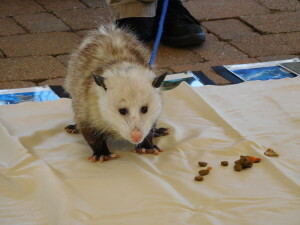 The next animal was Oscar the Opossum. When he was just a baby, Oscar’s mother was hit by a car. Both Oscar and his brother Felix were in her pouch at the time and were kept safe. Unfortunately, their mother did not survive so the zoo took both of them in. Oscar is about a year old and does not have the normal long tail that is expected of opossums, though the zoo isn’t quite sure why. The kids watched as Oscar ate his breakfast on a blanket in front of them, on the same type of harness and leash that you might see on a dog. The third and final animal of the morning was Laverne, a Black Ring-necked Dove. Laverne was also adopted by the zoo after her original owner was unable to care for her. 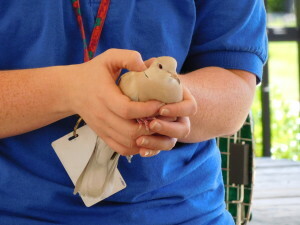 While she has full wings and possesses the ability to fly, she was extremely calm and happy to have Emily hold her. All were able to pet her tail feathers as Emily brought her around the group. All of the children enjoyed answering and asking questions about the various habitats and animals. Emily did a great job gearing the presentation towards the young group of listeners, and it was evident that she really enjoys her profession.